Rivers are of major importance to British wildlife. They are ‘green corridors’ that link habitats together along which species move and migrate through the landscape. Over centuries Britain’s river corridors have become increasingly fragmented due to drainage and agricultural encroachment. The Glaven, however, has survived the ravages of time pretty well and still provides a mosaic of important wildlife habitats along its length. The RGCG aims to protect the Glaven in this respect. At a simple, the Glaven is beautiful to look at. However it is also a chalk river, which is a rare habitat globally. The river valley is home to several protected and iconic species, such as kingfisher, heron, barn owl and lapwing. Aquatic mammals such as otter and water vole are also present, while the river itself is home to native white-clawed crayfish, eel, brook lamprey, stone loach, brown trout and bullhead. 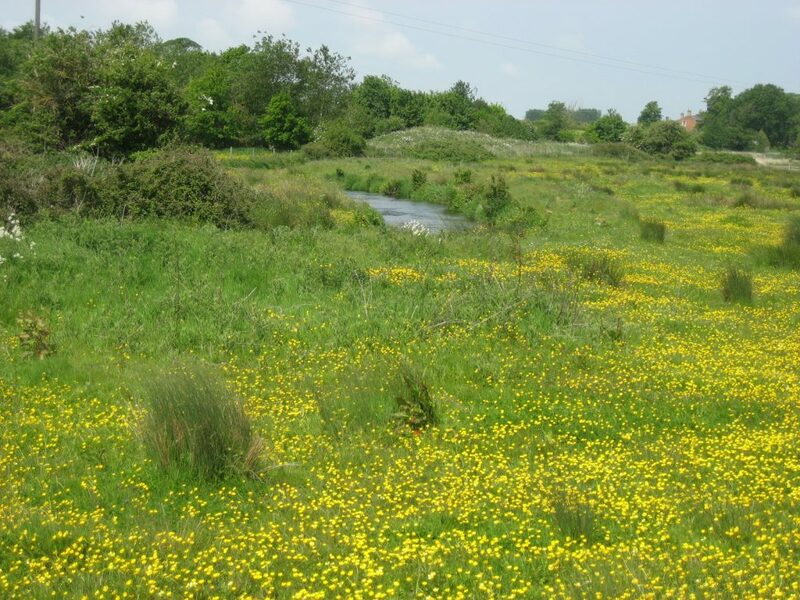 The Glaven’s meadows and floodplain forests are also very important habitats for biodiversity. Some of the Glaven’s meadows still support good populations of wild flowers such as marsh marigold, ragged robin, marsh orchid, meadow sweet, fleabane and water mint. This is a precious river which has suffered badly for about three decades due to pollution and poor management. Over the last ten years, however, the RGCG has started to reverse this declining trend. We need to maintain this progress in the years to come, hold on to what has been achieved, and move on to do more. To do this we urgently need your support. What is unique about the RGCG? The RGCG is a ‘bottom-up’ voluntary organisation. It is a resident-based body, driven by those who know and care for the River Glaven. We have sought, since, our inception in 1999, to work in friendly collaboration with landowners and farmers, statutory bodies such as the Environment Agency and other conservation bodies such as the Rivers Trust. One of the factors which prompted the formation of the RGCG was a concern on the potential impact of agricultural ‘run-off’ (of silt and nutrients) on the river system. In this respect, the RGCG had a ‘prompting’ and facilitating role with regards to the Catchment Sensitive Farming (CSF) initiative which was piloted in North Norfolk. The CSF initiative is sponsored by Defra and co-managed by Natural England and the Environment Agency. It aims to work with farmers to tackle diffuse pollution by managing ‘run-off’ and the RGCG has been strongly supportive of this initiative. In this respect the Royal Commission for Environmental Pollution (RCEP) was praising of the RGCG: “demonstrates the potential role of local, small-scale activists in driving adaptation behaviour, as they are able to bring different actors together”. What are the aims and objectives of the RGCG? The RGCG exists to protect and enhance the River Glaven, its tributaries and its floodplain. We aim to conserve and restore the habitat of the river, tributary streams, ditches, ponds and fen and wet grassland meadows for wildlife and landscape benefits. The first major project, on a stretch of the middle reach of the river upstream of Letheringsett, was funded by the Environment Agency and supported by the Wild Trout Trust, as part of a national initiative to help lesser well known chalk rivers: The “Cinderella Project”. This received a national award from the Wild Trout Trust in 2007. Since this time we have run, supported and assisted with several other river conservation projects. The RGCG also has an important educational role and we have strong links to Holt Hall Field Studies Centre, who regularly use the Glaven to educate Norfolk school children on river environments. We also have excellent links with the Environmental Change Research Centre at University College London whose MSc and PhD students have been involved in several ecological studies of the river and its associated meadows, lakes and ponds. We have had an active role in the re-establishing conservation grazing on some of the river meadows, and on one large site this required as a prerequisite the replacement of 2,000 yards of perimeter fencing. A local grazier provides a family herd of Highland cattle which graze at a low stock density but sufficient to keep down rank vegetation which otherwise takes over, to the detriment of the flora characteristic of the traditional meadow which has not been affected by agricultural ‘improvement’ in past years. Recently we have been involved in a major restoration project at Hunworth meadows and delivered by team including the Environment Agency, river engineer Richard Hey, the Wild Trout Trust, the Norfolk Wildlife Trust, and other specialists. This project has created a new and more sinuous channel with a more diverse river bed profile including deep pools and riffles. This should benefit fish and several other species at different stages within their life cycles. A different and very important aim is to try to eradicate or contain invasive non-native species which can inflict damage to the river-floodplain ecosystem. Himalayan Balsam can grow densely on a river bank, to the exclusion of all else. Mink can wipe out water vole populations. Worst of all are non-native crayfish, in particular the American signal crayfish. Once established they not only cause loss of the native white-clawed crayfish (akin to the red and grey squirrel story), but they can cause havoc with the whole ecology of the river. Most of the chalk streams in south east England have lost the white-clawed crayfish due to signal crayfish invasion. Attempts at eradication are hugely expensive and so far have met with little success. There is one ‘hot-spot’ on a Glaven tributary where we have a programme to hold the line and avoid infection of the river system as a whole. So far we have been successful thanks to the dedicated trapping work of our chairman Robin Combe. The RGCG see their activities very much as work in progress. There is much scope for extending the skill and experience gained to date on the Glaven to other parts of the river system which would also greatly benefit. For major restoration projects it would involve a wide partnership using the resources and skills of the type recently deployed on the project at Hunworth. For smaller projects it is may be mainly down to the RGCG to steer and carry out the work activities. The more local support the RGCG can bring to play, the better are our chances to receive to obtain the funding and resource to carry out the major projects; and the more active people we have to carry out practical work the better we can carry out ‘small’ projects and support the large ones. Large projects bring into play resources and funding which are way beyond the reach of the RGCG on its own. The more local commitment, the better are the chances of getting the support to realise these ambitions. We would like to see the Glaven become an ‘exemplar’ river system, where restoration goes hand-in-hand with other interests; that uses local knowledge and goodwill to catalyse the action; is a source of learning on the problems that might have been created in the past, and how these might be overcome; and promote a wider understanding of the connection between what as a society we might do, and how it affects our natural environment for good or ill.